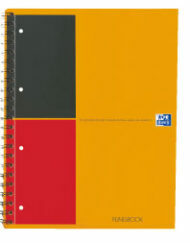 – Each notebook contains 100 color coded double sided detachable perforated pages as well as one fixed and three reposition able dividers to help users arrange their notes. -Double margins for noting dates,actions etc. -The top of each page has a multi purpose area for indicating the subject of a meeting, the date or other information.